Sciblogs | The National Parks of our waterways: Do they have any future under proposed Government reforms? Water Conservation Orders (WCOs) are statutory tools used to protect waterbodies of outstanding value nationally – rivers, lakes, and wetlands – much like mountains and coasts are protected by National Parks. They preserve or protect outstanding features such as fisheries, wildlife, Maori, cultural, recreational, wild and scenic or scientific values. They are to exist in perpetuity, unless amended. 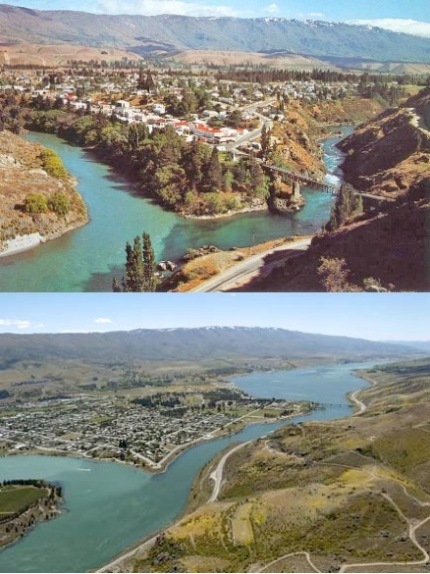 Confluence of Kawarau and Clutha Rivers and old Cromwell, before and after the formation of Lake Dunstan created by completion of the Clyde Dam in 1992, Otago. The WCO sets out necessary restrictions on water use so that the outstanding resource is maintained, such as prohibitions on damming, maintenance of river flows and water quality, and restrictions on in-river works. This process granting WCO protection is arguably more robust – and certainly more independent – than that required to create a National Park. The history of WCOs is set out here. Today, 16 water bodies have now been protected by WCOs. Many groups – notably Fish & Game NZ, QEII Trust, Whitewater NZ, Forest & Bird, some iwi and, in one case only, DOC – have applied for WCOs. Many outstanding waters, however, have never had WCOs applied for to ensure their protection. When the RMA was introduced in 1991, WCO provisions were transferred into the new environmental legislation to recognise and protect New Zealand’s outstanding waterways. However, despite the RMA being ‘environmental’ in its focus, there are few other means of actually securing enduring protection for resources (particularly freshwater) being managed under the Act. For example, while you can apply for a consent to take water from a river, it is not possible to consent leaving water in the river for ‘instream’ purposes. Part 9 of the RMA is a notable exception, intended to recognise and sustain outstanding values. Regional plans can provide some protection for instream values, such as by prohibitions on damming, but as these have a 10-year life they do not endure. Such prohibited activity rules are rare. Regional plans cannot recognise nationally outstanding values through an independent process, are also optional and some regions have not produced comprehensive plans protecting water bodies from development. Interestingly, although regional councils are responsible for water management, including the management of WCOs once established, they have often proved hostile to WCOs, seeing them as displacing local decision-making and fettering their options in water development. None of the original WCOs applied for were even supported by any of the regional councils in their respective areas. For example, on 13 March 2013 Otago Regional Council policy director Fraser McRae was quoted as saying “We also disagree with the use of water conservation orders. They are redundant.” Otago has a WCO on the Kawarau River catchment, administered by the Council. The Land and Water Forum (LWF) considered many aspects of water management, and recommended strengthening WCOs by ensuring that land uses do not diminish outstanding water values. This is contrary to the recommendations of LWF, and hardly inspires confidence in the Government’s desire for collaboration. In fact, the Government seems willing to cherry-pick desired results. It echoes the 2009 Environment Canterbury Act which halted consideration of a WCO application for the upper Hurunui River. It is also one-sided. Consider the outrage there would be if large consent applications were treated the same way, to be put on hold while alternatives may be sought. This is symptomatic of a raft of proposals in the Government’s RMA reform package, removing vital checks and balances against potentially unsustainable natural resource development. This is entirely counter to the intended purpose of the RMA which is to provide for use, development, and protection of natural resources. completely deleting reference to intrinsic and amenity values, finiteness of resources, stewardship, or the quality of the environment. What possible advantage can these changes have for protection of freshwater resources? These are also to be removed while consideration of various matters relating to resource utilisation is to be added. Government has advised these changes for ‘consultation’. Anyone not wanting this needs to signal their concerns by way of the public process and to your local MP as no doubt these matters will be put in a Resource Management Reform Bill soon. For more information on Water Conservation Orders visit: www.OutstandingRivers.org.nz. Neil Deans is the Fish and Game Regional Manager for Nelson and Marlborough with part time national responsibility for freshwater resource management. Good question Daniel. The scientific element identified in both Buller and Motueka WCOs is the underground waters of the karst aquifers underneath Mts Owen and Arthur. These water formed landscapes overly the deepest and longest caves in New Zealand. Although other scientific elements are incorporated into WCOs, such as protection for the threatened longfin eel habitat in the Nelson Lakes, after scientists found eels more than 100 years old in their waters.